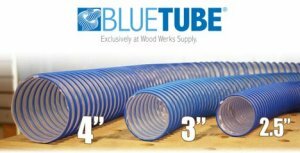 Flexible coil tubes are nothing new; we use them for everything from air ducting, to pool hoses, but the BlueTube borrows from the classic design and takes it to the next level. Typical hoses use some type of coil skeleton that is either molded into the tube, or covered by some type of material to create the tube. The flaw in this inner coil design is all the lumps and bumps that the coil skeleton creates along the full length of the hose. These bumps are places for dust to get trapped and causes air turbulence that cuts down on suction. The BlueTube solves this problem by using an exoskeleton coil, thus allowing for a completely smooth inner tube. This design is so affective, that even when tied in a knot, it can pull dust and debris through. With a relatively unexciting name like BlueTube, the product itself must be something to behold. WoodWerks calls it "the best dust collection hose in the universe", and I doubt they would lie to us just to sell a product or two. The BlueTube is available in 4", 3", and 2.5" sizes starting at $19.95 for a 10' length.